That’s not just a popular phrase for “Game of Thrones” fans, it’s a warning for pet owners too. Some dog breeds are better adapted to handle the cold weather of winter. 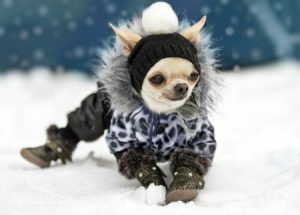 In general, smaller dogs, like many of the breeds here at Pauley’s Pups, are in need of a bit of extra protection during the winter season. While cold is the most pressing concern, there could be other conditions – like arthritis that can develop in older pups – that can be adversely affected by weather. Keep the following tips in mind for your pup this winter. First, you’ll want to make sure that your dog maintains a healthy weight during the winter months. Dogs depend on fat stores and their natural fur coat during the colder season, and smaller dogs do not have as large of a fat store as larger dogs. This means that they can be more at risk for hypothermia and frostbite. Toy breeds cannot spend an exorbitant amount of time outside when it’s cold. Their smaller bodies are just not well suited to the winter conditions. That’s why you may want to dress your four-legged friend before heading out in low temperatures. Adding a sweater to your dog’s ensemble can help them keep their core body temperature up, which is especially important since some breeds don’t have an undercoat. You may also want to keep extra blankets around the home, as well. Drafty homes can still get chillier than your pup may be comfortable with, and offering plenty of ways for him or her to stay warm is essential. Your dog’s paws can also be at risk during the winter months. Cold snow and ice can cause paws to crack or bleed from dry skin. To prevent this, consider putting little booties on your smaller dog’s paws before going for a walk. Smaller dogs are also more susceptible to getting salt in their paws. Salt is everywhere during the winter season, and can cause your dog’s paws to dry out more or be hazardous to their health. Make sure that the exposure to your dog’s paws is limited and wipe your dog’s feet off when they come back indoors after a walk. If you are considering getting a new dog and want one that tends to do well in cold weather, DogTime offers a list of several breeds best suited to colder conditions. These include miniature schnauzers, Pomeranians and Lhasa Apsos – all of which are breeds we sell! These longer-haired toy breeds have a thick undercoat that allows them to adapt to the cooler weather more easily, but they can still be at risk in extreme cold. If you are interested in adding a new pup to your family, stop in and see us on Washington Highway in Ashland, Virginia today, or give us a call at 804-798-7877.